I just can’t get enough of s’mores. They are one of my hands down favorite summertime treats. The only way to make them better? 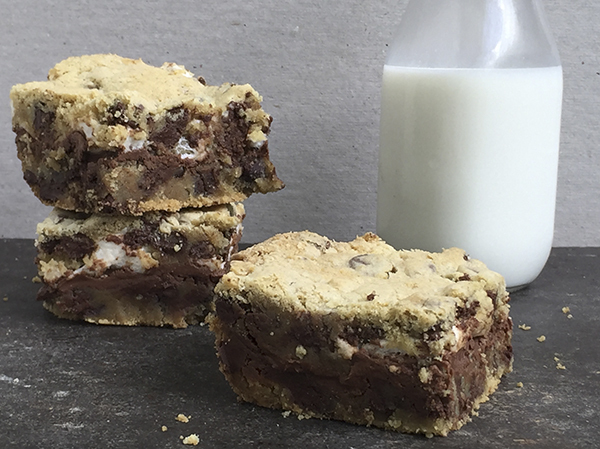 Stuff s’mores into cookies to make these gooey, s’mores stuffed cookie bars. They are hands down my favorite summer cookie. Goose definitely agrees. She was a down right marshmallow thief while I was taking these photos. Little stinker. 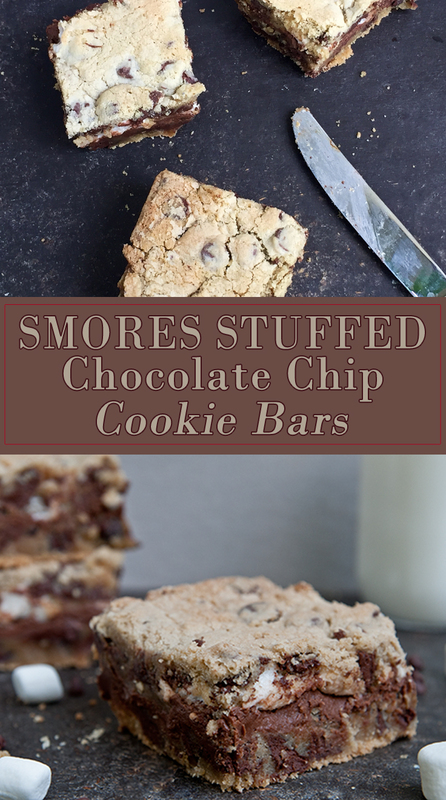 Better the marshmallows than the chocolate chips though. Have you ever seen what happens when a toddler eats chocolate chips on a hot summer day? It’s not pretty. The chocolate melts everywhere and gets in places that I didn’t think possible. I’m guessing that she’s up on skin care trends I don’t know about. Chocolate facials. Maybe it’s a thing. 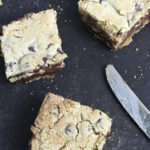 Back to the cookie bars. My husband actually surprised me by making this treat for me. It had been a tough week between a toddler that learned to undress and take her diaper off in her crib, a dryer that died, and dealing with a major car repair. The man is smart and throws cookies and chocolate my way. This is definitely one of the secrets to our happy marriage. 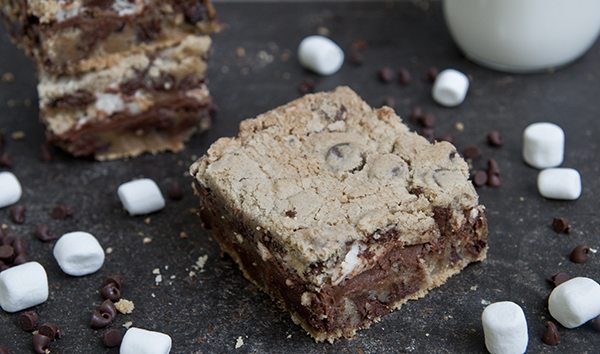 These s’mores stuffed cookie bars were the perfect cookie for that kind of crazy week. The recipe for the cookie dough base comes from my mother in law. The chocolate chip cookies she bakes are seriously addicting. Gooey, rich, and delicious, they might be the perfect chocolate chip cookie. Then take that cookie dough base, lay it down in a deep baking dish, and sandwich Hershey bars and marshmallows in the middle of it. Oh yeah. 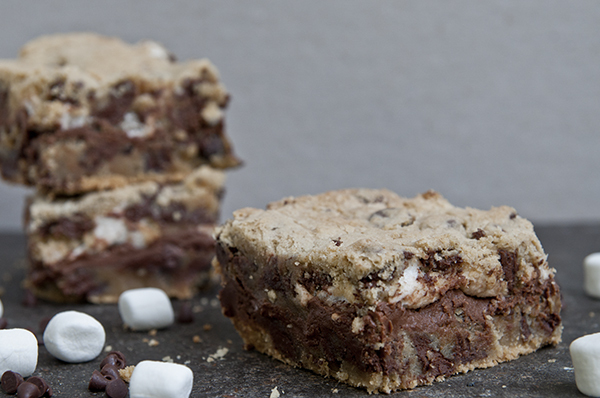 The resulting deep dish s’mores stuffed cookie bars are out of this world. 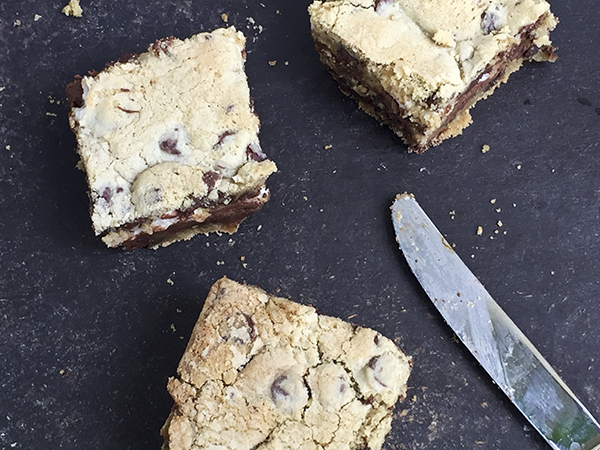 Soft baked and constantly melty, they are the cookie bar dreams are made of. Better yet for me, we updated the dough recipe to be gluten free by substituting the white flour with our favorite gluten free blend from Bob’s Red Mill. 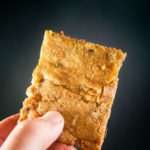 The recipe works well either made gluten free as we did or with the original version. Cream together butter, sugars, egg, and vanilla. Set aside. In another bowl, mix together flour, salt, baking powder and soda. Spread half the dough on the bottom of the casserole dish. Lay 6 Hershey Bars across the dough. Pour on the mini marshmallows. Flatten the other half of the dough and lay it on top of the marshmallow layer. Bake at 350 until the top of the dough is lightly golden, about 45-55 minutes. Let cool, cut into squares, and enjoy. * To make this recipe gluten free, substitute an all purpose gluten free flour blend. We use Bob’s Red Mill all purpose flour for this recipe and it comes out perfectly. **Check to be sure all your baking products are gluten free if needed. These look very delicious. Thanks for sharing the recipe. Yum! 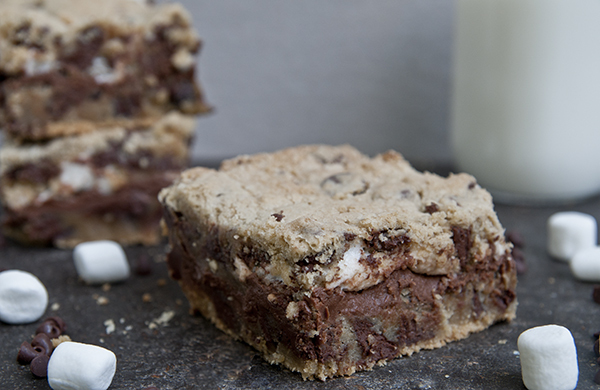 I love s’mores, and these bars look like the perfect way to get my fix. OMG this looks so good. I want this so bad. These look completely amazing and something that I need to bake ASAP. Holy Moly! These look amazing! Cannot wait to try this recipe! Thanks! Hope you enjoy Stacy! I’m really glad I don’t have the ingredients for these….because if I did, we’d probably be eating them for breakfast this morning haha! They look AMAZING!! They make a fine breakfast. I may have done that a few times myself…. OMG These look delicious! Can’t wait to try! These look so good! Thanks for the tasty recipe! This looks so good! I want some please! Umm… these look incredible!! So yummy! Oh my gosh these look so good!!! I need to try making these. 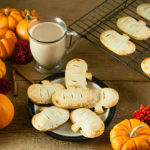 I might have to run out to get the ingredients to make these right now! They looks ah-mazing! Thank you Lee Anne. They are pretty delicious! Sharing is so overrated! Make and enjoy!! I hope they were a big hit Kristen! YUM!!! My family will be off school/work in the next two weeks… we are so making this!! Enjoy the treat and the time off! These look so great! 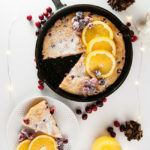 Perfect desert for this time of year! 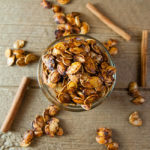 These are right up my ally and would make the perfect treat this weekend. I can’t wait to give them a try!!! I’m a sucker for all things s’more! These look delicious!! Anything with amores is amazing, I think. Thanks for sharing this recipe.